Sorry for the confusion, Mr. Marbury - not that kind of truck party. No, we're talking mobile food trucks, which of late have been establishing a foothold in Miami. This Friday a couple of the new additions - gastroPod, from Chef Jeremiah Bullfrog, and Latin Burger & Taco Truck, from Food Network personality Ingrid Hoffman, set up shop in close proximity to each other, and a food truck tour was in order. 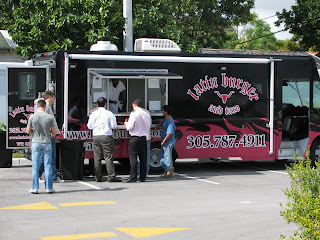 My first visit was to Latin Burger, which was camped out off Miami Avenue and 34th Street near Midtown. I managed to drive by twice before spotting the truck in the back of a parking lot behind a furniture store between 34th & 35th Streets, and I felt a bit like Tommy Vercetti trying to hunt down a target in Grand Theft Auto Vice City. You can get a "Latin Macho" burger, or a selection of tacos - chicken tomatillo, chicken mole or pulled pork. You can also add "Plain Jane" fries if you wish. I went with the "Latin Macho" burger and skipped the fries, knowing I was saving some room for a further stop at gastroPod. The burger uses a grind of chuck, sirloin and chorizo, and while it doesn't taste specifically like chorizo, it is a meaty, well-salted burger with a subtle backbone of spice that probably comes from the sausage in the mix. They use the double-patty approach like that employed by Five Guys, which starts to make up for the decision to cook all burgers medium-well (though not completely). The burger is topped with melted Oaxaca cheese, caramelized onions and jalapeños, all tucked within a soft sesame-seed studded bun. It is an excellent combination of toppings - creamy melted cheese, a lightly sweet-salty touch from the onions backed up with a little heat from the jalapeños - enough elements to give some flavor variety, not so many as to overwhelm. Though the menu says the burger comes with either "avocadolicious sauce" or red pepper mayo, it in fact came with neither - though another customer had the good idea to ask for the sauces, which were available in squeeze bottles. I topped the last quarter of my burger with some of the "avocadolicious sauce" - a thick, lightly creamy avocado puree - and it completed the package very nicely. This was a very good burger - maybe not as good as the one I had recently at Burger & Beer Joint (even if I screwed up by ordering one with too many goofy toppings there), but comparable to - naw, better than - a Five Guys burger; similar in style, but with the added bonus of more exotic and interesting flavors to the burger and the toppings (and at a comparable price). It is worth hunting down this truck if it's in your neighborhood. Next - a shiny object beckons - the gastroPod! Hi F, I wish I would be more adventurous to say that oxtail and trotter meat would be appealing from the gastropod, but I think the Latin burger menu would have more mass appeal, don't you? I WILL try them though...where is he usually parked? Is the Latin Burger like a frita? When I lived in L.A. my fave taco truck sold tacos for $.80 each! Finally was able to hunt down the truck. Liked tacos much more than the burger. Only beef was tacos were served on mediocre flour tortillas. I'm a corn tortilla guy only!! Other than that fillings were good and I'd recommend next time you're there. Skip the fries, I saw an Ore-Ida bag being pulled out. LDC - the use of chorizo in the grind is frita-influenced, but the toppings are not (no potato sticks!). And the pricing is definitely not like you'll find at an old-school taco wagon - though even Orale, which is about as close as you'll get here in Miami, sells theirs for about $1.50 / $2 a pop. 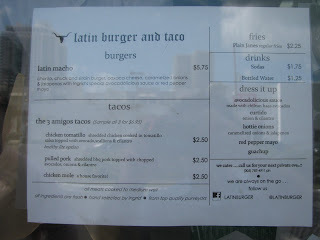 L2M - I'll have to try the tacos next, though I was pretty happy with the burger. It benefitted immensely from a little squeeze of the "avocadolicious" sauce. 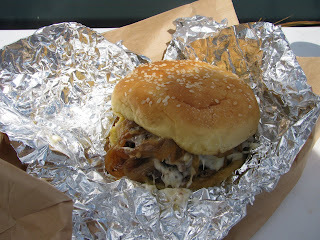 I was introduced to a frita last month in miami, and i gotta say, it was amaaaazing!! there's a burger place in dc called 'good stuff' and it is just the best i have ever had, EVER. plain farmhouse cheese is burger perfection.